We’re very excited to announce our newest integration with Vidyard, the personal video messaging tool designed for B2B sales professionals. You can now include videos in your Groove templates, and send them out in your Flows! Instead of trying to cram all the most relevant details into a concise email, this integration gives you the freedom to supplement a short email with an introduction video, a quick product demo, or maybe a customer testimonial. “Today, we're thrilled to welcome Groove to our Vidyard GoVideo ecosystem," said Kevin O'Brien, VP of Business Development at Vidyard. 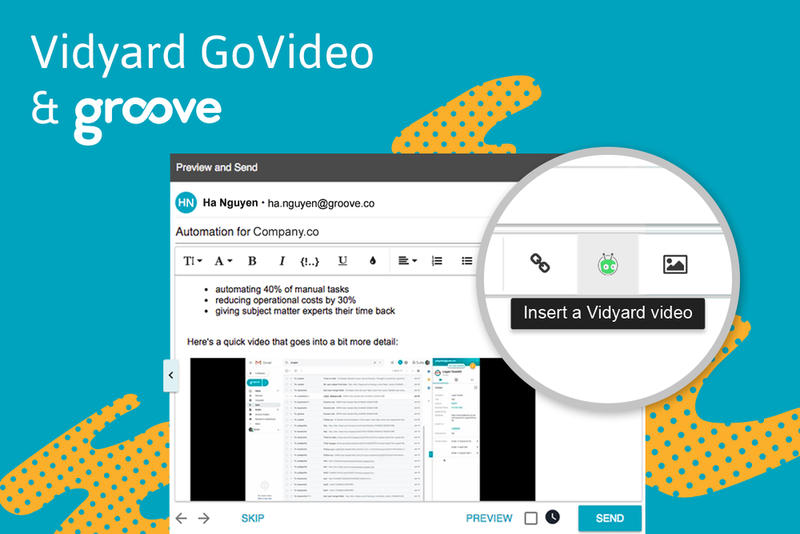 "By combining our flagship personalized video messaging app, Vidyard GoVideo, with Groove's world-class sales engagement platform, users can seamlessly incorporate video into their existing workflows, bringing the power of personal video directly to their customers." This feature is enabled upon request; please ask your Groove admin to reach out to support@grooveapp.com if you’d like to start sending videos in your Flows.